This information is also available under Sue's section. But for MORE information (and a slightly different point of view, sometimes) check out Chris's provisioning page! For more details on what is available where, across the Caribbean, South Pacific, and Indian Oceans see our pages on Caribbean provisioning, Fr. Polynesia provisioning, provisioning in Tonga and Fiji and Southeast Asia. Like most other cruisers, we have an obsession about provisioning. We always want our boat as full of food as possible even though that lowers the waterline by another inch with a ton of food. Crazy? Yes and no. As someone brilliant once pointed out, wherever there are people, there is food. 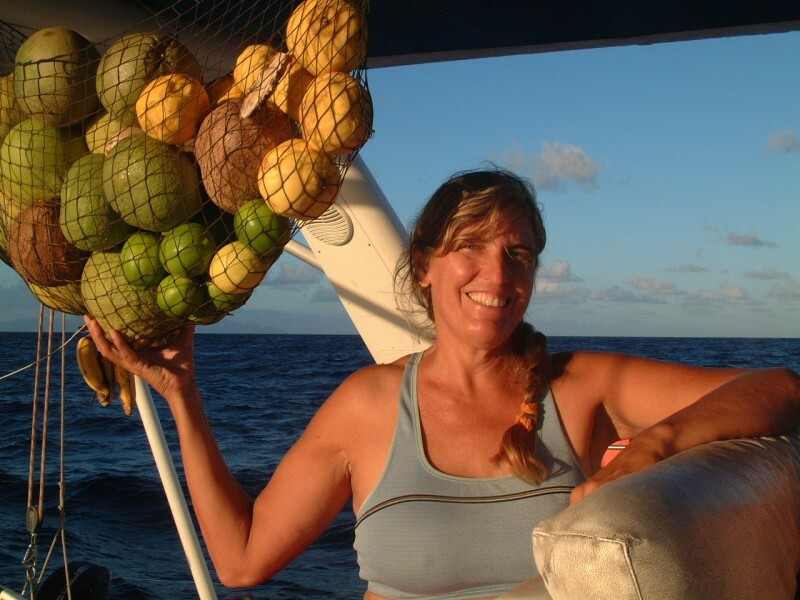 So except when we anchor off isolated, uninhabited islands (which we are prone to do for weeks at a time) there is always food to be bought ashore. So why the obsession with keeping the boat full? One reason is economic. Prices vary from island to island and country to country by 200 to 300%, and knowing this we try and stock up on non-perishables in the cheaper places. (You might call it being tight-wads, but we think of it as practicality -- what we don't spend needlessly on expensive food, we have available to spend on fun excursions ashore.) The other reason is a bit more esoteric and has to do with the lifestyle. We live on a boat because we like to be mobile. We travel to places that might, for one reason or another, suddenly become untenable. Prolonged holidays, strikes, politics, weather and sea-states may suddenly mean we have to up anchor and sail away from anywhere, anytime. With a fully provisioned boat we are free to do so. It's just one more part of the cruisers' credo (borrowed from the Scouts) -- Be Prepared. So what constitutes a fully provisioned boat? We can't say we won't bore you with a list (see below! ), but suffice it to say that we could sail away today (and that means any day) with enough food to stay a couple months away from civilization. Probably longer if we didn't mind a pretty strange diet. While much of the provisioning is canned, including meats, fish, veggies, butter and juices, we also have hundreds of kilos of dried beans, flour, oats, pasta, milk powder, crackers, fruit and rice. 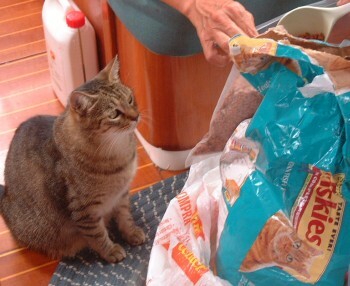 We even carried cat food when Arthur was on board! To keep life interesting we've got a good assortment of spices and herbs. And then there are the non-edibles like toilet paper, toothpaste, etc. which fill other spaces on the boat. Amanda created a computer spreadsheet to keep track of where all the items are located, and in what quantity. With more than 20 lockers in the salon, 6 cabin sole lockers and 3 lockers in the guest cabin dedicated to food, the spreadsheet is invaluable. The trick is keeping it updated each time we remove an item. For more on information, see Chris's page on provisioning from his point of view. We gained a whole new appreciation for stocking a boat for extended periods when we were in Panama and Equator, trying to fill Ocelot with enough stores for the 6-7 months it would take us to get somewhere with reasonable prices and supplies. When leaving South America for the South Pacific we stocked up with six months of food, knowing that prices in the Pacific islands would be much higher than in South America, and wanting to be as independent of “civilization” as possible. We were pleased to find the prices of food in the Galapagos (Puerto Ayora) were not much more than mainland Ecuador, and this allowed us to re-provision with things we’d used in our weeks in the Galapagos. We used boat stores, obviously, for the 24 day passage to the Marquesas, then continued using them for several more months as we traveled through the Marquesas and Tuamotus before reaching the big (but expensive) shopping centers of Tahiti. The following is the list of the one ton (literally!) of food we had on board for four people, including a very hungry teenage boy. We used the original provisioning list to add up the weights, and once we were well across the Pacific we were able to add notes on storage longevity, prices and availability of items across the South Pacific. 173 lbs juice syrups Long lasting. Available everywhere, but not as cheap. 96 lbs boxed juice 4-6 month life. Avail. Everywhere, but not as cheap. $1/liter is good. 68 cans soda/tonic A treat on Ocelot. Expensive to replace, so we stopped replacing. 220 lbs canned veggies Long lasting. Available everywhere, but not as cheap. Less than $1/can is a good price. 10 lbs instant mash potatoes Available again Fr Poly (Tahiti). Not so cheap..
2 lbs cous-cous Available many places. Ditto. 47 lbs nuts Hard to find. Peanuts are common. Pecans rare. 20 lbs cereal Very little choice except in "warehouse stores"
5 lbs granola bars Hard to find. Try “warehouse stores” and Fr Poly. We gave up eating them. 96 lbs canned meat Corned beef is cheap & everywhere. Canned chicken is a treat avail. mostly in the Americas. 36 bags junk food A treat on Ocelot. Expensive elsewhere. Fattening!! We've given them up. 15 lbs chocolate, candy European choc. avail but expensive. Cheap candy everywhere. 8 lbs shampoo Name brands avail. but expensive. Local brands cheap. 2 lbs sundries Ditto as above on deodorant. Vava'u, Tonga choices are poor. 20 lbs bananas Hang a stalk. Ripen en masse!. Avail. everywhere. 20 lbs apples Wrap each in newspaper for 2 mo. storage without fridge. Imported throughout the islands. 20 lbs grapefruit S. America and Fr Poly only. Long lasting. Fr. poly has huge "pamplemousse"
4 lbs limes Long lasting if kept in basket with air circulation. Availability varies..
cabbage, carrots OK room temp short time, then must fridge. Best to buy unrefridgerated. Standard veggies in islands. 15 lbs chicken Boneless for storage in freezer & fridge, in 4-serving bags. Major supermarkets carry meat. 30 lbs cheese Waxed rounds keep 2-3 months in bilges. Longer in fridge. Some choice in islands. We successfully vacuum bagged cous-cous, instant mashed potatoes, rice, sugar (white and brown), oats and dried beans. Pastas either poked through the vacuum bags or broke up too small to be nice, but we tried, as they get weevils very easily. Pasta sold in boxes is no good for longevity. Flour and powdered sugar caked when vacuumed and were hard to work with after opening. Powdered milk kept well if it was in foil pouches. Crackers in stack packs were far better than those loose in boxes. We often had to re-toast crackers to freshen them up. Extra sharp cheese in black wax, and hard cheeses like parmesan kept very well in dry bilges, without refrigeration. The softer cheeses like Edam and Gouda were okay in unbroken waxed rounds then put in zippered bags from which we sucked out the air. When possible we vacuum bagged the cheeses. Once open they went into the fridge. Some people keep cheeses outside the fridge, but they get pretty oily, then ripe! For passage-making we often buy “luxury foods” we don’t normally eat on board. These include canned soups that open with a pull tab (ideally) and don’t need water added; instant hot chocolate packets so no measuring or adding sugar is necessary; instant flavored oatmeal, and granola bars; canned meats like salmon, chicken, beef stew, and ham which can be eaten cold or hot and prepared quickly and easily. Instant mashed potatoes are filling, good for queasy tummies, and make good potato soup. Baking is a good way to keep the boat warm if the evenings (or days) are cool and overcast, so we make biscuits, cake, bread, breakfast rolls, etc. if the seas allow. It also keeps morale high to have “fun food.” Some cruisers pre-make dinners and have them in the fridge or freezer. We don’t have freezer room for this, and being a catamaran we are probably able to cook in more seaways than monohulls. Also pre-cooked meals take up fridge space that we prefer to use for ingredients. A backpacking mentality has been helpful: we use powered milk, powdered juice mixes, cous-cous, seasoning salt (with spices and garlic) etc. We bought lots of boat supplies in Ecuador and Venezuela. Prices were good, and quality OK, but longevity varied. Some masking tape disintegrates in the tropical heat. Varnish was cheap, but cans rust if you’re not careful. Foam brushes for varnish are not available outside USA-stocked stores. Epoxy is best brought in plastic jugs, not metal. You can get epoxy in most cities with marine industries, but not always the brands or mixing ratios you want. Fiberglass cloth and tape lasts forever if you keep it dry and sealed up and it’s cheaper in South America. It doesn’t pay to carry anti-fouling paint for long distances: the chance of rusting cans too great. (We had a horrible experience on Sabi Star that may have killed one of the crew from the fumes that leaked under her bed.) Things like silicon tubes, Sikaflex, lubricants, etc. are available in most countries at the big hardware stores, but we carried many of each along from South America. We preferred the smaller tubes as once open, tubes quickly go off and you get a tube of solid bouncy stuff! We left the Galapagos with full water, diesel, propane and gas tanks. We had extra Jerry jugs of water, dinghy gas (pre-mixed), and diesel. We carry 3 propane tanks (2 steel, 1 stainless steel). We get 4-6 weeks of use from each propane tank depending on how much we bake! We’ve been able to fill both the US and French fitting propane tanks everywhere. Several countries like French Polynesia have a system for buying duty-free diesel which is very worthwhile. Ask at customs how it works. For more details on what is available where, across the Caribbean, South Pacific, and Indian Oceans see our pages on Caribbean provisioning, Fr. Polynesia provisioning, provisioning in Tonga and Fiji and Southeast Asia.